MIAMI, FL--(Marketwired - July 11, 2016) - On Saturday July 9, Florida East Coast Railway (FECR) celebrated with its partners, the arrival of MOL Majesty, the first neo-panamax vessel to transit the expanded Panama Canal bound for PortMiami. The MOL Majesty is part of the G6 Alliance Transpacific PA2 service, originating in Asia. Carlos A. Gimenez, Miami-Dade County Mayor, and Panama Canal Authority Administrator, Jorge Quijano, were among the distinguished guests who joined PortMiami, FECR and other partners to welcome the MOL Majesty. "We were glad to be at the celebration in support of our partner, PortMiami. FECR has invested in infrastructure and equipment to support multi-modal shipping and global trade into and out of South Florida, and can support neo-panamax vessels such as the MOL Majesty," said James R. Hertwig, President and CEO of Florida East Coast Railway. "We offer customers a seamless transfer of goods from ship to our on-dock rail facility that allows fast access to 70 percent of the U.S. population, reaching key Southeast markets of Atlanta and Charlotte in two days." FECR re-established on-dock intermodal rail service at PortMiami allowing import and export cargo to be loaded directly onto, or off of, awaiting trains, linking the port to 70% of the U.S population in 4 days or less. FECR can also facilitate the transloading of international freight into fewer domestic containers for inland moves, to markets such as Memphis, Chicago, Cincinnati and Dallas. "A new big ship era is here and PortMiami and its partners are ready," said PortMiami Director and CEO Juan M. Kuryla. "The completion of PortMiami's deep dredge and FECR's on-dock intermodal rail projects cannot be overstated. 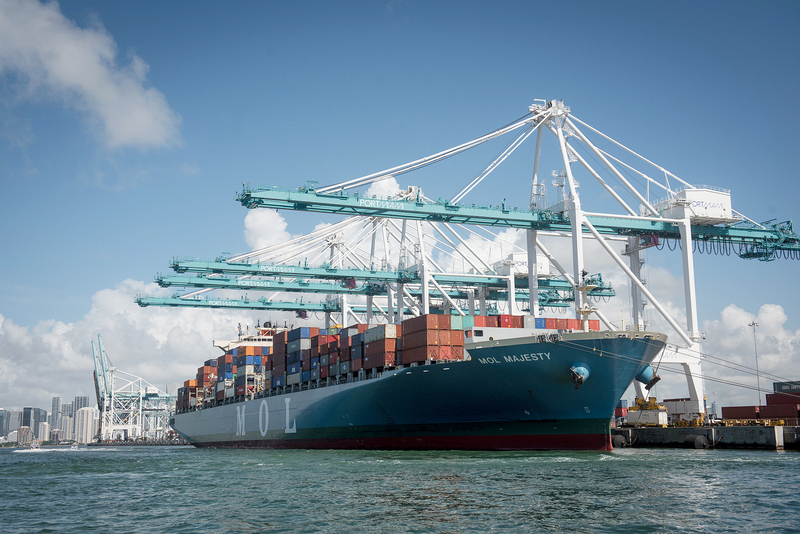 PortMiami is now positioned as the most reliable, convenient and efficient global hub on the North American East Coast serving the world's leading ocean carriers." Experts expect an increase of 10 percent in shipments to be rerouted through the now expanded Panama Canal to eastern seaboard ports like PortMiami. FECR expects to grow their share of container traffic transported following the expansion and shift in trade routes. On Saturday July 9, Florida East Coast Railway celebrated with its partners, the arrival of MOL Majesty, the first neo-panamax vessel to transit the expanded Panama Canal bound for PortMiami. The MOL Majesty is part of the G6 Alliance Transpacific PA2 service, originating in Asia.